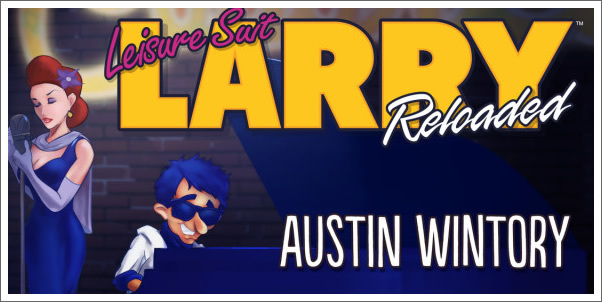 LEISURE SUIT LARRY: RELOADED is a remake/reboot/belated continuation of an ancient series of point-and-click adventure games about a loser computer programmer in his 40s who experiences a sudden sexual awakening and heads off to the city of Lost Wages (guffaw) in an attempt to seduce any woman who will have him. All very high art, I’m sure. The game got off the ground thanks to a Kickstarter fundraiser started by the original games’ creator, AL LOWE, and it therefore seems surprising that the music for this game comes from none other than AUSTIN WINTORY, fresh off of making history with the first ever Grammy-nominated game score, JOURNEY. On WINTORY’s Bandcamp page, the score is described as “featuring obsessive use of AL LOWE’s original theme” for the original games. This catchy little tune does indeed crop up in fragments throughout the score and WINTORY gets a lot of mileage out of it, but it’s not nearly as omnipresent as that statement suggests. The entertaining but brief opening cue does immediately presents that theme in its original 8-bit format before adapting it into the dominant style of the rest of the score: big-band jazz. It’s certainly a good match for Larry’s exploits. The score is pretty much a series of stylistic vignettes, with only the LOWE theme and the umbrella genre of jazz acting as anchors; not quite a “theme and variations” score, but in that neck of the woods.